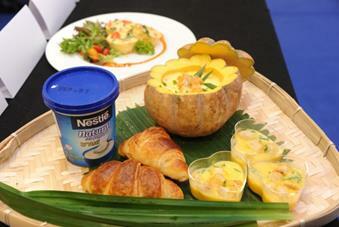 Cooking enthusiasts were in for another treat this year at the Nestlé Natural Set Yogurt Masak & Menang contest. Five finalists showcased their creativity to the theme of “1 Nestlé Natural Set Yogurt, 2 Flavours’’ by incorporating Nestlé Natural Set Yogurt in their dishes. These multi-talented home cooks were hand-picked based on recipes they had submitted online, with an inventive twist of taste and flavour. 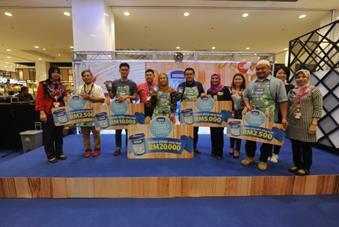 The grand finale of the contest took place in Shah Alam, where the home cooks brought their best cooking skills to the ultimate cook-off to win the title of Nestlé Natural Set Yogurt Masak & Menang Champion 2017. The contest offers prizes worth a total of RM40,000. The main dish of a Red Snapper, Green Curry Paste, Potato Cooked With Turmeric and Charred Cucumber with his Lime Mousse, Blueberry Granola and Thyme dessert prepared by Yap Chuin Sien, the youngest contestant at only 23 years old, from Negeri Sembilan, took home the second place prize worth RM10,000 cash. The third place with RM5,000 cash was won by defending champion, 28 years old Muhammad Falihin from Johor, with his own distinctive twist of thePasembor 2.0 and the Badak Bersiram dessert. “It has been a great competition and it was really hard to decide who the winner will be as all of the participants presented great dishes. I’m amazed to see that despite coming from various regions, they share the same vision, which is to replace high fat cooking ingredients such as santan (coconut milk), butter, heavy cream and mayonnaise with the Nestlé Natural Set Yogurt. They did a good job coming up with such inventive recipes, creating dishes that are tasty and wholesome.’’ said Chef Siti Mastura. 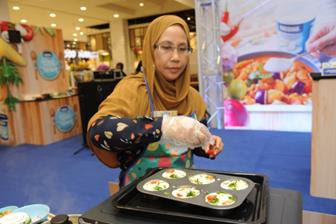 “The Nestlé Natural Set Yogurt Masak & Menang contest aims to inspire home cooks to prepare healthy meals by substituting high fat cooking ingredients with Nestlé Natural Set Yogurt. We are looking for a cooking enthusiast who has the flair to come up with creative and innovative dishes that can encourage Malaysians to live healthier. We want to tell them that we can still be healthy and yet enjoy the best of Malaysian dishes. This is in line with Nestlé’s purpose of enhancing quality of life and contributing to a healthier future for all Malaysians,” said Fiona Tan, Business Executive Officer, Nestlé Chilled Dairy. “The National Health and Morbidity Survey in 2015, says that at least 17.7% of the Malaysian population are obese while another 30% of the population are categorised as overweight. Hence, we are determined to do our part by offering a healthy substitute for high fat cooking ingredients with Nestlé Natural Set Yogurt,” added Fiona. Nestlé Natural Set Yogurt is an all-natural, low fat plain yogurt that is freshly produced with care to ensure the balance of firmness and smooth, silky curd-like texture; defining the quality of set yogurt. Each serving of 100g contains only 57kcal and 1.6g of fat compared to the 28.3g of fat in the same amount of santan (coconut milk).The signature taste of Nestlé Natural Set Yogurt will bring out an aroma of wholesome goodness in any dish that you cook. It also can be experienced by eating it on its own for its nutritious goodness, attributed to live cultures that aid digestion.